Valentine Tool & Stamping, an award winning ISO9001 compliant company, has demonstrated Excellence and Innovation in the manufacture of Precision Metal Components for over 60 years. 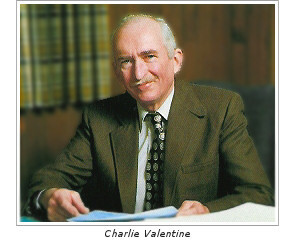 Founded by Charlie Valentine in 1946, Valentine has earned the reputation as one of New England’s premier contract manufacturers of High Precision Metal Stampings. From our inception Valentine has sought the challenge of manufacturing difficult and tightly toleranced precision metal components and stampings. Valentine meets this challenge with our philosophy of embracing a consulting engineering approach, employing early engineering design assistance with our customers, to insure the most practical and cost effective solution for component manufacture. From this thorough understanding of the customer’s design specification, we can then proceed to design and fabricate tooling to establish a robust manufacturing process that will provide consistent and reliable quality, part after part, order after order. Valentine augments our metal stamping expertise with additional manufacturing operations including secondary press and machining operations and contracted value added services. Valentine’s metal stamping and metalworking expertise has earned industry wide customer confidence and loyalty, allowing us to establish strategic supplier partnerships with our customers, including the following: Sensata Technologies, (formerly Texas Instruments), for automotive metal stampings, IBM for computer connectors and IC component stampings, Polaroid for camera and film products, and Smith & Nephew and Medtronic for medical component stampings. Let Valentine review your metal stamping needs and allow us to demonstrate how we can add value and quality for all of your precision metal component and stamping requirements. High Precision / Tight Tolerance Capabilities.